How Far is Shantha Radha Govind Residency? Shantha Radha Govind Residency is one of the popular residential projects that is located in Miyapur, Hyderabad. 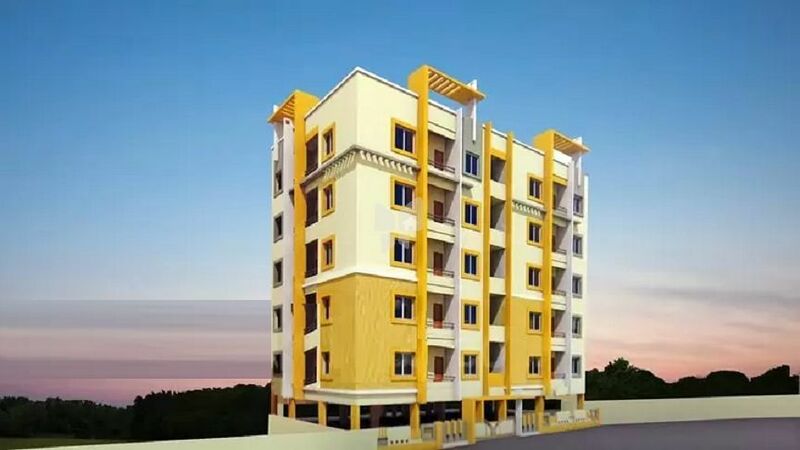 Developed by Shantha Constructions, this project offers thoughtfully constructed 3BHK apartments. It is situated close to the market, hospital and various educational institutions. Isolated R.C.C footings with tie beans for earth quake resistance. Good quality flyash brick wall with â€“ outer 9th thick & inner 4.5â€� thick walls with cement mortar. INTERAL: Single coat sponge finished cement plastering. CEILING: Single coat sponge finished cement plastering. EXTERNAL:Double coat and faced cement plastering. MAINDOOR:BEST TEAT WOOD Frame & Teak paneled door shutter. With esthetically designed and polished. JOINERY:Teak Wood frame and hard-core flush shutter with painted and standard hardware. TEAK WOOD glazed shutters with safety grill. INTERAL: Two coast of emulsion over a base coat of primer. CEILING: Two coast of emulsion over a base coat of prime. Two coats of acrylic emulsion paint over a base coat of primer. BEST QUALITY VITRIFIED TILES in all areas and Antiskeid ceramic tiles in toilets. Telephone points in hall and master bedroom. Concealed cables to hall & master bedroom. 6Passenger lift with V3F technology with generator backup.